The Labour Welsh Government has not achieved its own ambitions to get people walking and cycling, a former minister has said. Huw Irranca-Davies led a debate on Wednesday calling for a strategy to invest in infrastructure and ambitious targets. Despite passing a law in 2013, levels of walking and cycling are in decline in Wales. A minister said he would work on developing more ambitious targets. AMs - with government support - unanimously passed a motion calling for action on Wednesday. The Welsh Government led the Active Travel Act through the Welsh Assembly in 2013. The legislation aimed to boost walking and cycling across the UK, placing obligations on councils to provide network maps - showing existing routes and future plans - and to continually improve routes for walking and cycling. But figures showed last May that the number of people walking and cycling to work had not increased in the first five years it was on the statute book. 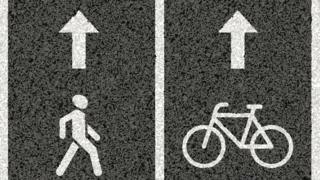 Mr Irranca-Davies criticised the Welsh Government's performance on walking and cycling, saying it had not achieved its own ambitions, and called for more investment in walking and cycling infrastructure. The former minister for children and older people cited plans in Scotland to double investment to £80m a year. The Welsh Government has earmarked £60m over three years for walking and cycling. "We want the Welsh Government to recommit to the ambition they originally set out back in the 2013 act," he said. "That ambition was clear, that Wales would be the country where it was the most natural thing to walk and cycle. "We are a long way away from that." He called for ministers to "bring forward a strategy that has the detail on the targets, on how we are going to achieve it, on how we turn communities and schools into genuinely active travel". "We do not have that strategy in place. It simply isn't there," he said. He said there needed to be "joined up thinking" to use money that has already been allocated "to shift people out of their cars". The calls were backed by a cross-party group of AMs, including Conservatives. Welsh Conservative transport spokesman Russell George said: "I am glad to see that a cross-party alliance built to support the Active Travel Act has matured into one designed to properly scrutinise the Welsh Government on the issue. "The fact that the Welsh Labour Government's act has been law for over five years and they have since failed to make any significant progress makes a mockery of its own legislation." "The act has very good intentions, but there is a lack of political will and imagination within the Welsh Government to see it through to the end," he added. Transport deputy minister Lee Waters said the Welsh Government will be supporting the motion. He said he plans to work on developing more ambitious targets on getting people walking and cycling for everyday use, such as to work. Mr Waters said: "In 2008 I personally introduced the petition to the assembly to call for the creation of an Active Travel Act and I led the campaign to create the cross party coalition to achieve the passing of the act. "I completely accept that we need to be ambitious because we are trying to achieve a culture change. "Overturning a century of designing our living spaces to prioritise the private motor car is never going to be easy and the agenda behind the Active Travel Act is not going to be achieved in one generation." "We have to make sure that there are robust foundations in place. Whilst we have made a good start... we have now got to focus on the detail," he added.